Tedeschi Trucks Band took over headlining duties at day two of Atlanta’s SweetWater 420 Fest on Saturday, and the band welcomed young guitar phenom Brandon “Taz” Niederauer for a few songs during their performance. Between Passover and Easter, this weekend had everyone on the move, including 14-year-old guitar phenom Brandon "Taz" Niederauer. In fact, I'm willing to bet Taz had a crazier weekend than you did. His two-day marathon began on Saturday night, when he and his new band celebrated the legacy of Jimi Hendrix at Garcia's in Port Chester, NY. The evening marked the 50th anniversary of Hendrix's final studio album Electric Ladyland, and over a single set Taz put his own spin on the legend's work. One highlight, which you can watch below, was a fiery version of the 1967 track "Spanish Castle Magic," bolstered by Taz's standby vocalist Elise Testone. Throughout the set, Taz also welcomed guests like Living Colour bassist Doug Wimbish and blues-rock guitarists Marcus Machado and Joe Stuby. On Easter Sunday, Niederauer headed downstate to New York City to perform on the live television broadcast of Jesus Christ Superstar. As the show began, Taz was the first cast member onscreen, playing the opening licks of show's overture on his D'Angelico guitar. The show featured shock-rocker Alice Cooper as King Herod, singer Sara Bareilles as Mary Magdalene and soul-superstar John Legend in the titular role of Jesus Christ, and Taz's electric guitar kept the plot moving, as he performed musical interludes between scenes. The guitarist looked pretty comfortable as a part of the house band, and thanks to his time starring in Broadway's School of Rock musical, he had no problem playing to the audience or the camera. Presumably, after these two days of performing, it was back to school on Monday for the high school freshman. As Niederauer once told Jambands.com, "Music and school are definitely both priorities," with neither one holding precedence over the other. Check out Taz and his band performing "Spanish Castle Magic" at Garcia's, as well as the show's full setlist and a few photos from Jesus Christ Superstar below. We are very excited to share that Brandon will join David Shaw's 2018 Big River Getdown Saturday, September 8 in Hamilton, OH. The full lineup will also feature The Revivalists, Samantha Fish, Andy Frasco & The UN, Jennifer Hartswick and Naughty Professor. Now in its 22nd year, the annual Blues on the Fox festival has attracted music and blues fans from all over the state and even the country. Featuring some of the hottest artists singing the blues and up-and-comers destined for stardom, Blues on the Fox pays tribute to musicians John Lee “Sonny Boy” Williamson, Tampa Red, Big Bill Broonzy and others who recorded their historic sound at the Leland Hotel in downtown Aurora. Pay tribute to the past, rock out with the present and prepare for the future of blues at Blues on the Fox. Taz will perform on Saturday, June 16. Tickets are on sale now! 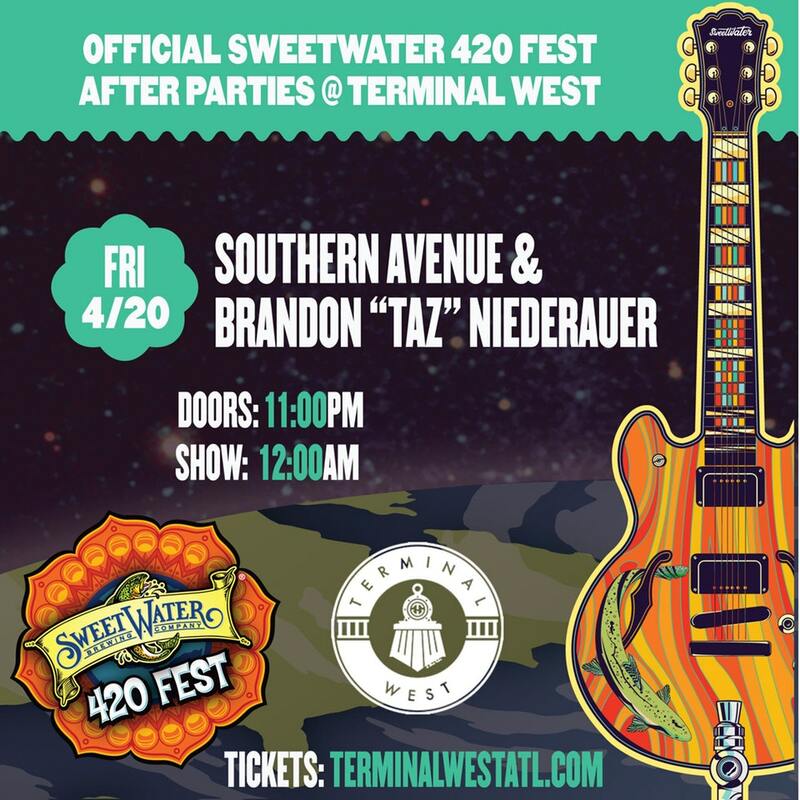 Brandon will perform Friday, April 20 at Terminal West in Atlanta as part of Sweetwater 420 Fest's Official After Party with Southern Avenue. Doors at 11p, show begins at midnight. This Easter Sunday - April 1 - Brandon will join the cast of Jesus Christ Superstar Live in Concert on NBC. Stay tuned for more details! New Orleans during Jazz Fest provides the ultimate platform for artists to pay tribute to their favorite bands, musicians, and songwriters. The city is hallowed grounds for any musician, as it is ground zero for jazz, funk, and the improvisation that acts as the core of today’s live music scene. For Michelangelo Carubba, drummer in the power-funk group Turkuaz, the impetus to pay homage to his influences while in New Orleans was so strong that, instead of picking between his favorite bands, he decided to pay tribute to two of them at once! Z-Funk: A Tribute To Led Zeppelin & Parliament Funkadelic will feature unique arrangements of songs by Led Zeppelin and P-Funk, with an all-star band that features some of the best and funkiest players he could find. Z-Funk will take place on Sunday, April 29th (technically early AM 4/30) immediately following Aaron Johnston‘s electronic improvisation project, J.E.D.I. (Jazz Electronic Dance Improvisation) at the same venue, Maison on Frenchmen Street. For this special performance, Carubba will be joined by pedal steel master Roosevelt Collier and guitar prodigy Brandon “Taz” Niederauer, who will team up to form a high-octane dual-guitar attack. Steve Swatkins of Allen Stone‘s band will be on keys, and will surely make use of his talkbox skills as well. Rob Walker, bassist from The Main Squeeze, will hold down the low end, while Carubba’s partner in Turkuaz, Shira Elias, will provide vocals. Finally, Snarky Puppy‘s Mike “Maz” Maher and Chris Bullock will provide some much-needed brass on trumpet and saxophone, respectively. With so many amazing songs in each band’s repertoire, the night will surely feature hit song after hit song. Carubba has proven himself as a uniquely motivated bandleader, concocting many special tribute shows in New York City, Colorado, and elsewhere over the past few years. He has promised to have a few tricks up his sleeve for this show, and by leaning on the catalogs of Led Zeppelin and P-Funk, has crafted the perfect way for those in attendance to close out weekend one of the marathon that is New Orleans Jazz Fest. Tickets for this show are on-sale NOW. There is a 24-hour discounted pre-sale running, which you can access at this link. Standard tickets go on sale tomorrow, Friday, March 16th at 1:00 PM EST. For full information on this show, including the show art from Jimmy Rector (@jimmyrector), see below. The 7th Annual Nolafunk Series During Jazz Fest has just added a number of new shows and special guests to their series lineup. The series along with Live For Live Music have just announced two late-nights with Spafford at Republic NOLA on Friday, May 4 and Saturday, May 5, as well as The Purple Party, an all-star tribute to Prince to closeout Jazz Fest on Sunday, May 6 at Maison featuring members of Prince, Turkuaz, The Motet, Snarky Puppy & more. During the first weekend, Samantha Fish will do a special guest sit-in with Anders Osborne at The Howlin’ Wolf on April 28. Fourteen year old axe virtuoso Brandon “Taz” Niederauer will do special guest sit-ins with Voodoo Dead on April 27 and Foundation of Funk on April 29 at the Howlin’ Wolf. The Bonerama Horns will also join Foundation of Funk on April 29. Finally, the Whiskey Bayou Records Revue: Eric Johanson & Jeff McCarty will join Tab Benoit’s set on May 4 at Republic NOLA, the Delta Rhythm Revue, a show that also features Samantha Fish. More special guests will be added on that show as well as others in the series. 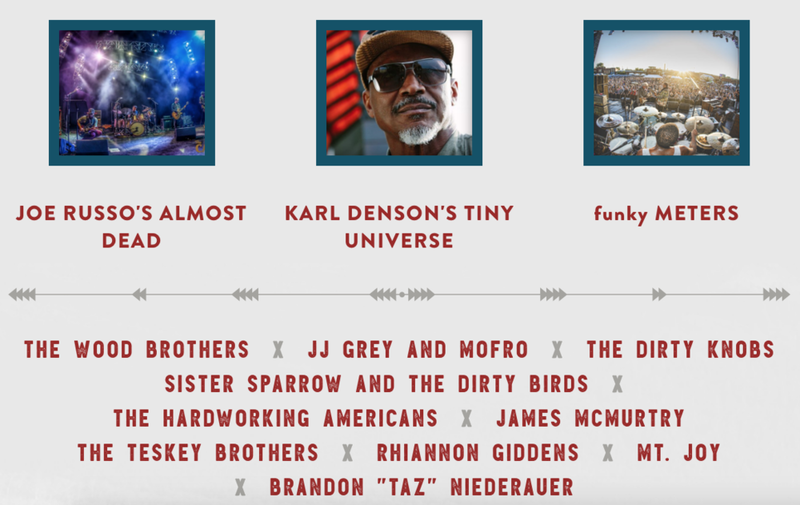 Roots, Rock, and Americana is coming to the Tetons for the 14th Annual Targhee Fest - July 13 - 15, 2018. Targhee Fest is about great music, the culture and lifestyle of the mountains, great food and drink, the spirit of sustainability and the hospitality that resides in the Tetons. Brandon opens his set with a blistering version of Skuttle Buttin during his first-ever headlining performance at Brooklyn Bowl. Last night, the Phantom of the Opera celebrated their 30th anniversary as the longest-running production in Broadway history. At the end of the night, composer/director Andrew Lloyd Webber stepped out for a special curtain call. At the 3:50 mark of the live feed, Webber introduces the School of Rock: The Musical cast to perform the theme song of Phantom of the Opera. In uniform, Brandon “Taz” Niederauer–who played the role of “Zack Mooneyham” for the first two years of production–steps out for a roaring guitar solo before being joined by the rest of the original cast. The energy can be felt across the screens, as these kids–all under the age of 15–shred the Broadway stage once again. This April, Brandon "Taz" Niederauer will head down to Atlanta for the 2018 Sweet Water 420 Fest taking place April 20-22 at Centennial Olympic Park. This year's festival features sets by The String Cheese Incident, Umphrey's McGee, Tedeschi Trucks Band, Sturgill Simpson, Vulfpeck, Joe Russo's Almost Dead, Greensky Bluegrass and more. Ticket are on sale now at www.SweetWater420Fest.com. Masters weekend (Friday, April 6), Brandon is headed to Augusta, GA for the 2018 Major Rager featuring George Clinton & Parliament Funkadelic and The James Brown Band + Special Guests. Tickets and information is available at www.TheMajorRager.com. Backstage at venues where Brandon “Taz” Niederauer performs, visitors are likely to see him cracking his school books. The 14-year-old guitarist says that in his family, school comes first. For Niederauer, backstage means places like Broadway, in New York, where he has been a star of the movie-inspired “School of Rock” musical. Backstage means places like iconic New Orleans nightspot Tipitina’s, where he first sat in at age 8 with funky bass guitar king George Porter Jr. Or the “Ellen” show, when he was 10. Or venues where he sat in with the Gregg Allman Band, or Buddy Guy, or Lady Gaga, or Doctor John, or Stevie Nicks. That’s the short list. On Friday and Saturday, the teenage jam scene prince’s backstage will be at Roanoke’s 5 Points Music Sanctuary, where the straight-A student and his band will open for guitar innovator Stanley Jordan on Friday, then get the night to themselves Saturday. It will be Jordan’s second appearance at 5 Points. Read our piece with Jordan, previewing his May show there, at bit.ly/2BgW1dm. Niederauer, in a phone interview Monday from his family’s home on Long Island, New York, spoke praise for the headliner. “Stanley Jordan completely innovated the way that guitar is played,” Niederauer said. “He plays it like no one else. He plays with two hands. He can play a bass part and a guitar part at the same time, or a low part and a high part. I’ve sat down and had conversations with him, and he is the most intellectual musician I’ve ever talked to. He just makes the guitar sound like someone singing. That’s something only the best of the best can do, and I hope that I can do one day. He is amazing, and I cannot wait to open for him. Niederauer, who was inspired at 8 to take up guitar after watching the “School of Rock” movie and then four years later joined the Broadway cast, has received his own share of lofty praise. In a video at youtu.be/Huj1JG4jUYE, Grammy-winning drummer Robert “Sput” Searight of Ghost Note and Snarky Puppy tells an audience, “We call him ‘the grown man.’ ” Pedal steel guitar master Roosevelt Collier has said the same. Key mentors for Taz were Allman Brothers Band drummer Butch Trucks and jamband pioneer and performance artist Col. Bruce Hampton. In just the past year, Trucks, Hampton and Allman have died. Hampton collapsed on stage at an Atlanta show celebrating his 70th birthday, dying in a hospital later. Just before he collapsed, he gestured to Niederauer to play, then went to his knees and waved his arms toward the kid before going to the ground. Performers onstage at the time thought that it was just Hampton doing schtick. After all, his many onstage eccentricities included speaking in tongues, rolling around on the stage floor, playing solos with a chain saw and gargling peanut butter. “It’s really hard for a 14-year-old to go through the loss of so many people that I know,” Niederauer said. “I was really close — really, really close — with Col. Bruce Hampton. I was really, really close with Butch Trucks. Gregg Allman, I knew him well, and he knew me. He mentioned Porter Jr. and former Allman Brothers Band guitarists Derek Trucks and Warren Haynes as other players who were selfless, welcoming him onstage. Niederauer was part of Haynes’ 29th Annual Christmas Jam last weekend in Asheville, North Carolina. After he picked up guitar, he began to put in hours and hours on the instrument, with his father, Gary Niederauer, by his side, watching his development. Taz said he didn’t even realize how much time was passing. Testone sings most of the leads, but Niederauer’s vocal capabilities are growing, as well. He only started singing in public when he joined the “School of Rock” cast two years ago. He has embarked on a songwriting path and is working on original numbers to fit his voice. At this point, he sings lead on about 40 percent of the songs in his sets, and harmonies on almost all of the rest, he said. Meanwhile, he has to keep his grades up. College is in his future, he said, with his parents helping him keep his studies together. His favorite subjects are math and science. When he was a child, he wanted to be a scientist, maybe even an astronaut. Nowadays, a business degree sounds good, to help him control financial aspects of his career, he said. Fourteen-year-old guitarist Brandon “Taz” Niederauer has had a career in music and entertainment that exceeds what people twice his age might ever hope to achieve. He recently took the Broadway stage as Zack Mooneyham in Andrew Lloyd Webber’s “School of Rock the Musical.” He has played with artists such as Gregg Allman, Lady Gaga, Slash, Stevie Nicks, Warren Haynes, Derek Trucks, The Revivalists, George Clinton and Parliament Funkadelic, Dr. John, Jon Batiste, Dweezil Zappa, and more. He is coming to the Acoustic in Bridgeport on Friday night and Daryl’s House in Pawling, N.Y. on Saturday with his own band. Besides playing in a band, as noted, Brandon played a young rock musician in “School of Rock the Musical” in the Broadway production. The experience also taught Brandon about how to perform in front of an audience. “If we are performing our roles with convincing emotion and feeling than the audience gets sucked in and you can feel their energy,” said Brandon. “I think we are a blend of rock, funk, blues, and gospel – with a little jazz thrown in. New Orleans music is also in there,” said Brandon, who is also accompanied by Mark Rechler on keys, Matthew Fox on bass, Kendall Everett on drums, and Colin Logatto on sax. A sought after young guitarists in the world was not enough, 14 year old Brandon Niederauer has not just a head of golden locks but also a “heart of gold”. This past weekend from October 6th-7th at Pisgah Brewing Co in Black Mountain, NC, red-hot “psychedelic southern rock” stars The Marcus King Band hosted their first ever two-day festival, dubbed the Marcus King Band Family Reunion.